Absolute Insurance Agency is one of the most trustworthy and reputable full-service insurance agencies around that provides a range of coverage solutions to residents in West Des Moines, Des Moines, Clive, Waukee, and Urbandale, IA. Whether you need homeowner's insurance, insurance for your commercial establishment, coverage on your automobiles, motorcycle insurance, coverage on your RV or other recreational vehicles, or insurance coverage for any other purpose, we can provide you with the most comprehensive coverage solutions available for rock bottom rates. Absolute Insurance Agency, LLC has relationships with multiple, top-rated insurance companies. This means that our agents work with numerous carriers to get our clients the best pricing, policy options, and coverage. 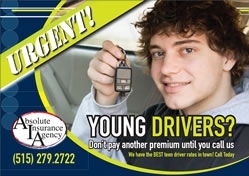 Some insurance companies are locked into only one company, but we are fully independent. This is advantageous to you as our customer, because you get access to the best insurance pricing available when numerous carriers compete for your business. If you need superior insurance solutions you can trust, we are the go to source in the Des Moines Metro area, and other nearby areas in the State of Iowa. 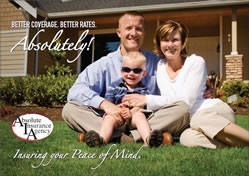 Be sure to ask about umbrella coverage options, and view our website for further information. Absolute Insurance Agency is licensed in Arizona, Colorado, Illinois, Iowa, Kansas, Michigan, Minnesota, Missouri, Nebraska, North Carolina, Ohio, and Wisconsin. Contact us today for all of your Iowa insurance needs, or for any further assistance you may require. You can always count on friendly, knowledgeable, and professional service when you choose Absolute Insurance Agency as your insurance provider of choice. One of Des Moines' fastest growing Insurance agency offers exciting group pricing when it comes to packaging your auto, home, umbrella, and toy policies.